The Lagos Book and Art Festival (LABAF) is an annual art and cultural festival with high book content, bringing together everybody from all works of life. It has been earmarked as the culture picnic, filled with fun, thrills and full cultural entertainment. The festival features theatre performances, readings, exhibitions, live music, workshops, book parties and sessions for the children which are handled by the Children and The Environment (CATE). With time, the festival has grown to be a world class cultural event and a high point in the nation’s cultural calendar. Over the years, LABAF has attracted a great number of individuals and organisations or institutions such as: Nigerian Institute for Cultural Orientation, National Gallery of Arts, National Theatre, National Museum, Centre for Black Arts and African Studies, and President Goodluck Jonathan’s ‘’Bring Back The Book’’ team. Also, LABAF derives support from cultural and corporate organisations such as Zenith Bank, Coca cola, Nigeria Liquified Natural Gas (NLNG), DV Works, French Cultural Centre, Goethe Institut, Terra Culture, Jason Vision, Steve Rhodes Orchestra and Crown Troupe of Africa. This year’s event is in partnership with the British Council and the Hay Festival. 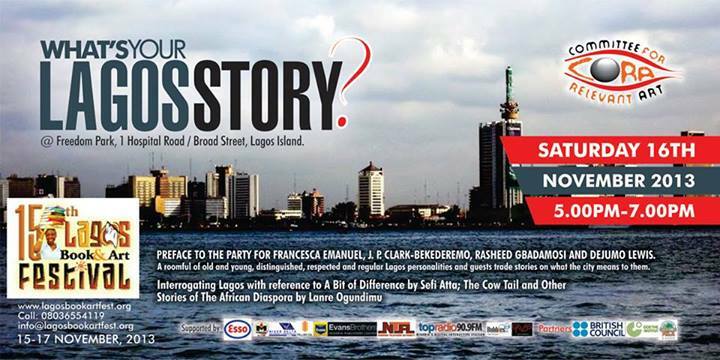 The theme for this year is: THE NIGERIAN CENTENARY- THE LAGOS STORY which comes up from November 15th-17th at Freedom Park (Old colonial prison site), Broad Street, Lagos Island; 10.00am to 7.00pm each day. It will feature special guests such as Nasir El Rufai, Professor Akin Adesokan and Julius Agwu. The event will also be in memory of the literary icon ‘Chinua Achebe’. LABAF is put together by Committee for Relevant Art (CORA) whose mission is to create an enabling environment for the flourishing of the contemporary arts of Nigeria and to increase human capacity of the continent. CORA is a recipient of Prince Claus Award received in 2006, as an honour to the ‘energetic activities’ and in order to pay attention to the ‘contribution of dedicated civilians to stimulate the arts. CORA is the co-organizer behind several events like the quarterly Art Stampede, open air Cinema Carnival and Lagos Comics Carnival. Furthermore, it is the publisher of the quarterly magazine Lagos The City Arts Guide, it publishes books and founded several libraries. It also serves as a platform of various forums, like the Arthouse Forum. This entry was posted in Uncategorized and tagged Arthouse, arts, Book, british council, CATE, Children, Committee, CORA, environment, festival, Goethe Institut, Hay festival, LABAF, Lagos, Lagos Island, Nasir El Rufai, National Gallery of Arts, Nigeria Liquified Natural Gas, Nigerian Institute for Cultural Orientation, NLNG, Prince Claus, Relevant arts. Bookmark the permalink.